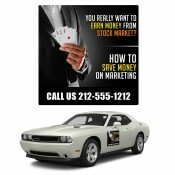 Custom car door magnets refer to promotional magnets used over car doors during outdoor advertising. These outdoor magnets are printed in full color and are weather proof (UV coated). Full color magnetic car signs are perfect for building impressions for your business while on the move without overspending. 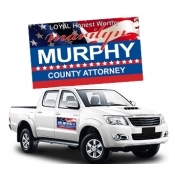 These car magnets can be used between two vehicles and are perfect for building impact without any added efforts. Save on ground UPS shipping anywhere within the contiguous USA. You might have already spent sleepless nights pondering on how to brand your business Do you know what the major difference is between owning a business and managing a brand? A business owner always goes in search of a business whereas a brand proprietor gets business without knocking doors. Although for most people there is hardly any difference between a business owner and a brand proprietor they mean a lot. 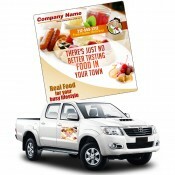 If you wish to convert your business into a brand with minimum efforts, look no further because these outdoor promotional magnets are simply the one for you. No wonder, our clients who are requesting promotional outdoor car door magnets includes landscapers, botanists, residential clients, pool maintenance professionals, bars, pizza delivery services, real estate agents, insurers and more. 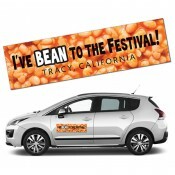 These promotional outdoor magnets build impact with their largesse and never-fade attitude. People can easily see it from the distance and understand your business information imprinted on it. Contrast colors attract maximum attention from a distance. You can go lavish with the choice of your colors because we offer free full color printing. Our outdoor magnets are built on 30 Mil stock material which is weather resistant and UV proof. This means, marketers can easily drive on sunny, rainy or stormy day with confidence that their business information is going to receive the highest visibility. Way back it was widely speculated that magnetic advertising kills with its exorbitant pricing and it is an expensive indulgence. We have purely quashed this myth by offering these outstanding customized outdoor magnets which is cheaper than newspaper advertisements. Logo printed car door magnets not only aid in popularizing a business but also for promoting sales Marketers are using it for driving special sales programs, announcing discount programs, loyalty programs, holiday sales, etc. Additionally, colorful outdoor magnets announcing charity events, fundraisers and social events are becoming a common sight. We offer free art setup and free online design proof with all customized automotive magnets and other promotional magnets. Feel free to contact us at info@CMagnets.com or 855-762-4638 (Toll Free) to know more.